A study of the popular writings of Feng Menglong (1574-1645) will reveal some prevalent attitudes towards qin during the late Ming dynasty. Here, as in other popular literature of the time (including theater), the qin is generally depicted as an elegant instrument, but it is also often associated with seduction. The following preliminary discussion of qin as mentioned in Feng's writings was done mostly by online searches of Chinese text. Several stories within these collections are of particular note. For example, Jingshi Tongyan has one called 俞伯牙摔琴謝知音 Yu Boya Shuai Qin Xie Zhiyin, translated as Yu Boya Smashes His Zither in Gratitude to an Appreciative Friend; there is some discussion under Bo Ya as to whether the name Yu Boya began with this story as related by Feng Menglong. Jingshi Tongyan also relates the story of Sima Xiangru's seduction of Zhuo Wenjun. 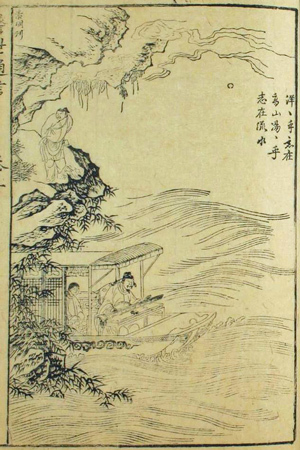 And Dong Zhou Lie Guo Zhi has a story connected to a qin melody surviving from 1525, Doorbar Song (Yan Yi Ge). Note that often the mention of qin is in stock phrases rather than as depictions of playing. Thus 琴劍 qin jian (qin and sword) refers to a wandering scholar; 琴棋書畫 (qin, chess, books and painting) describes a cultivated person; and 琴瑟 qin se (marital harmony) often suggests a seduction. Born near Suzhou, style names 猶龍 etc., also many nicknames. Basic references include Wiki and ICTCL (which states, "As an ardent champion of popular literature in its numerous forms, he contributed more to its preservation, growth and diversity than any [other] individual in premodern China). See also the online Chinese Colloquial Short Story and Its Style: A Study of the San-yen English Renditions in Late 19th – Early 21st Centuries. Howell, E. Butts. The Restitution of the Bride and Other Stories from the Chinese (New York: Brentano’s Publishers, 1926). This book is long out of print but is available in some collections such as the NUS library. Yang, Shuhui, and Yunqin Yang. Stories Old and New (Seattle; London: University of Washington Press, 2000). A complete translation, partly online, e.g., via Google books. Yang, Shuhui and Yunqin Yang, Stories to Caution the World: A Ming Dynasty Collection (Seattle; London: University of Washington Press, 2005). A complete translation. George Soulié de Morant. Chinese Love Tales (previous title: Eastern Shame Girl; 1935). Available online. For mention of qin in operas and songs by Feng Menglong see the footnote below. 湯湯乎，志在流水。 Furiously bubbling - imagining flowing streams. 洋洋乎，志在流水。 Spectacular - imagining flowing streams. Few of the 11 titles listed actually depict qin play. The available translations often mis-translate qin as lute. This seems to be a re-working by 蔡元放 Cao Yuanfang of Feng's 新列國志 Xin Lie Guo Zhi. It mentions qin in at least 14 of its 108 stories. According to online information in 2006 Shaanxi Tourism Publishing House published this in 2 volumes under the title Eastern Zhou Zhi, but the listing at biblio.com seems to suggest it is in Chinese; see also amazon.com. I have not yet seen it. "Qin and sword" is often seen in popular writing (see, e.g., above). It seems generally to suggest someone who has refined tastes but is willing to fight for his beliefs. There is a qin handbook called Handbook of Qin and Sword (1749).